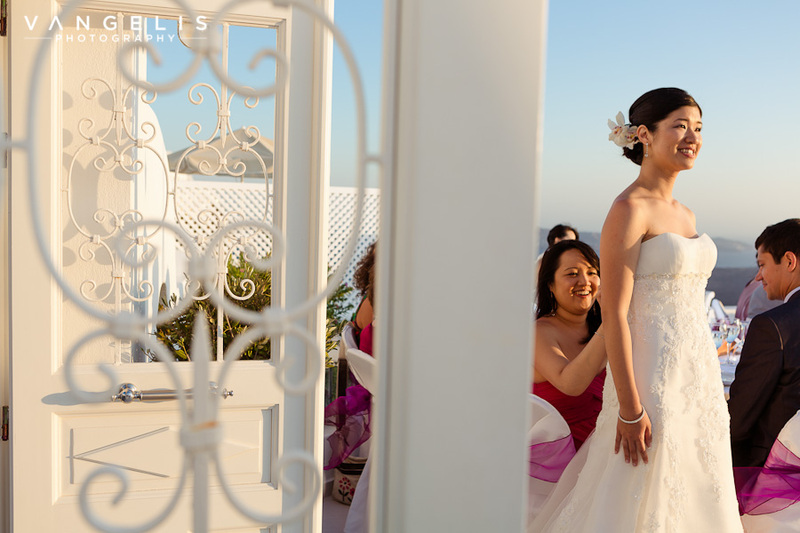 Stephanie and Wallace, a lovely young couple from the Guernsey Islands in the United Kingdom had their dream wedding in Santorini on the Dana Villas wedding Venue. 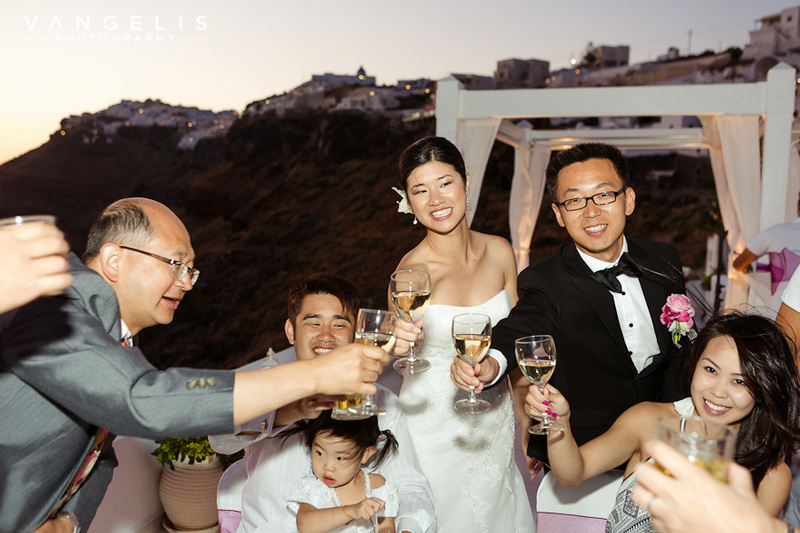 The young couple accompanied by their family and closest friends traveled to Santorini to enjoy a relaxing holiday and the most important day in their lives. 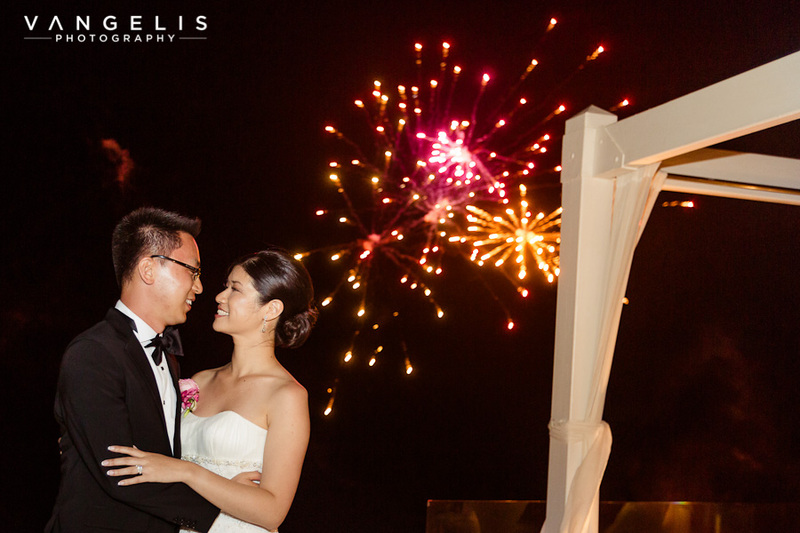 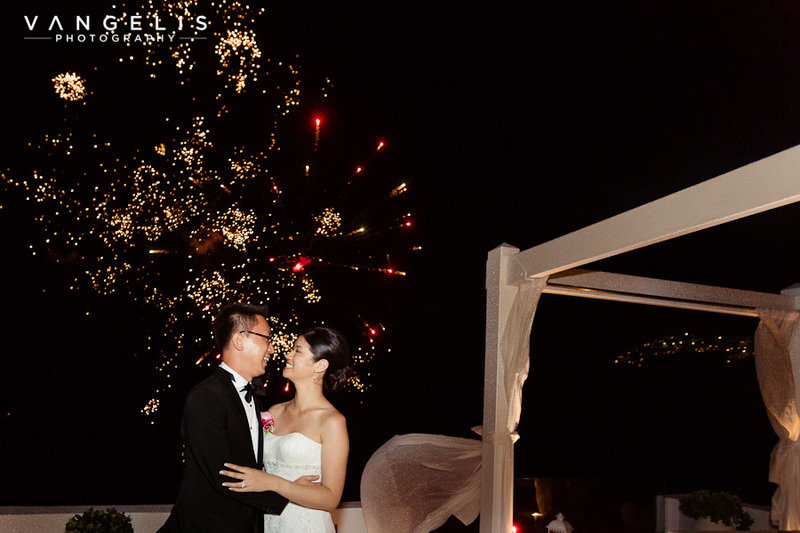 Stephanie & Wallace where in close contact with Poema weddings the many months before their wedding day which were their chosen wedding specialists that would create for them their dream day as they had in mind. 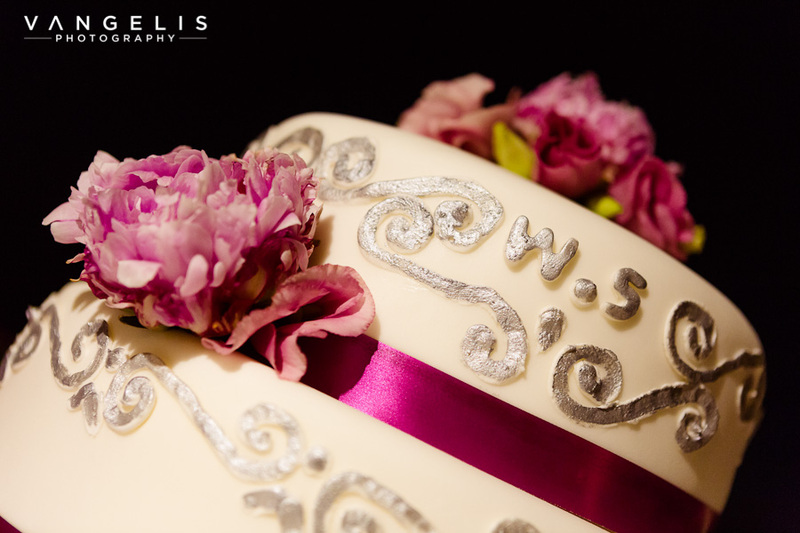 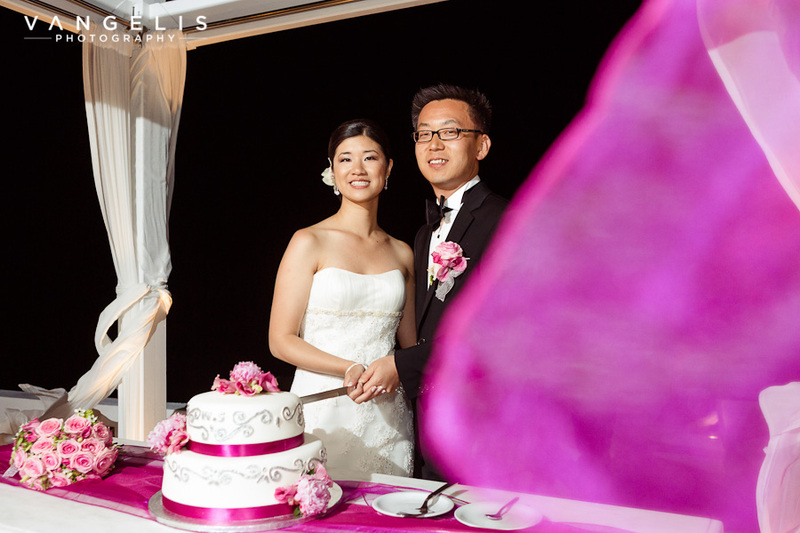 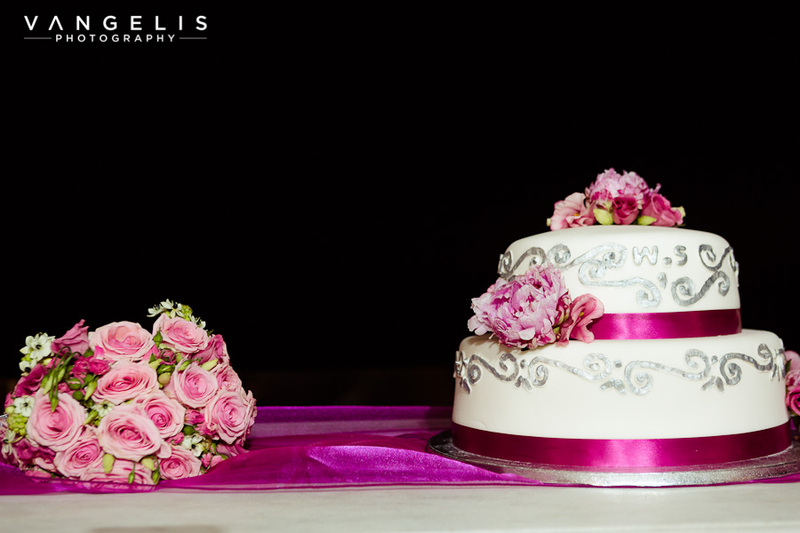 Stephanie’s dream was that her wedding be of a pink and purple theme with elegant details and aqua pink roses for the floral decor arranged by Agrokipio – wedding wish floral creations. 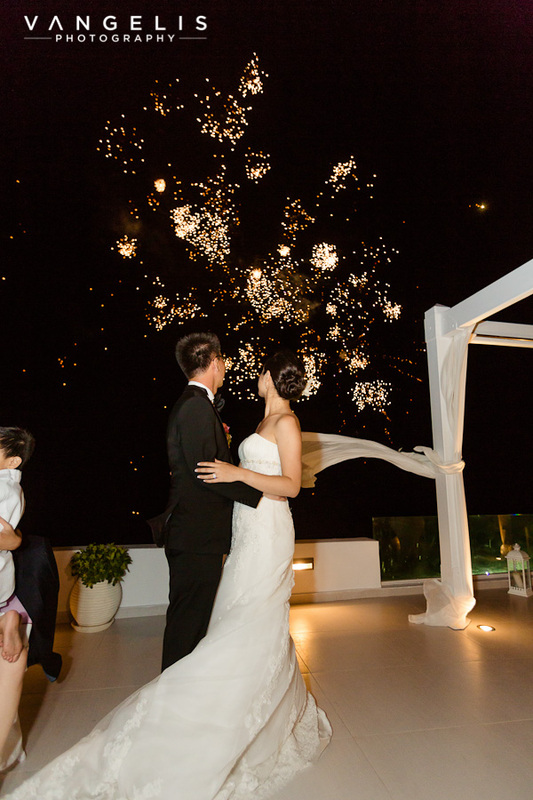 The Dana Villas bright white wedding patio was the perfect spot as all the decorations and accessories where in strong contrast to the bright white and created the elegant setting that Stephanie and Wallace had wanted to have their special moment and honor their guests for traveling so far just to be with them. 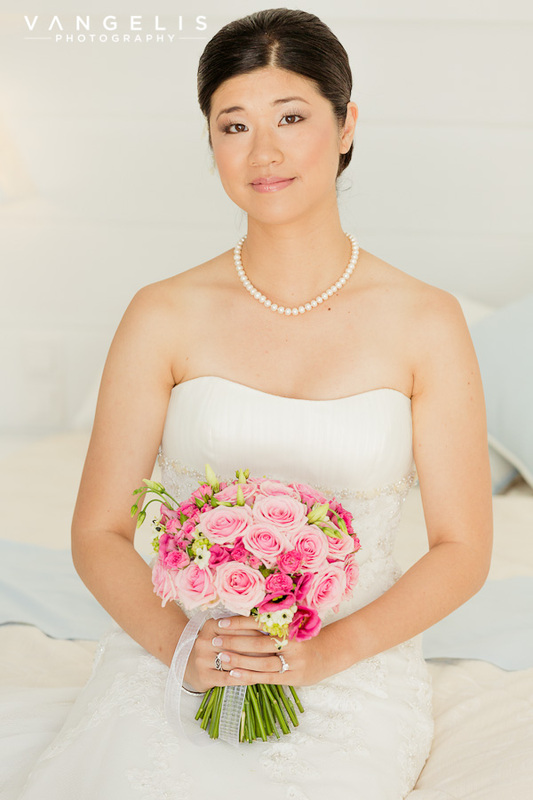 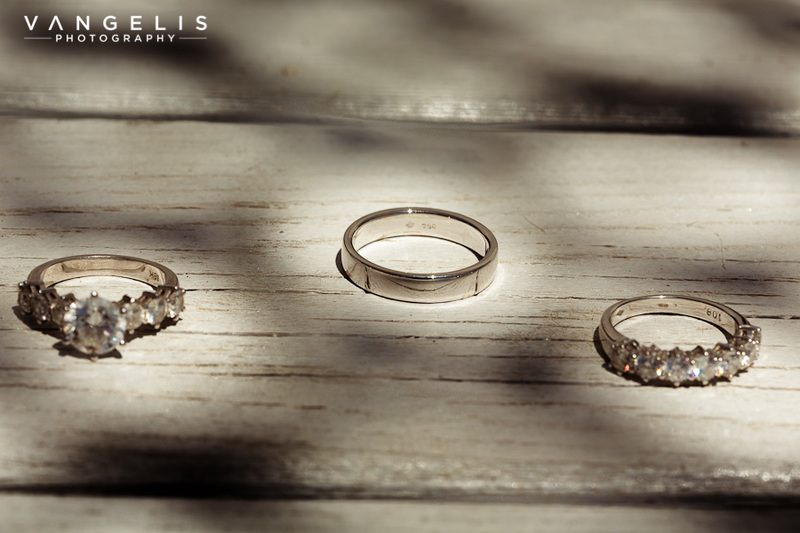 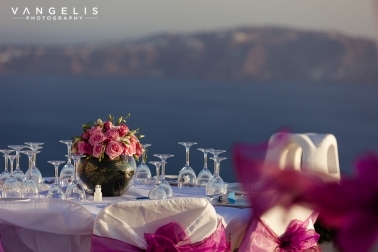 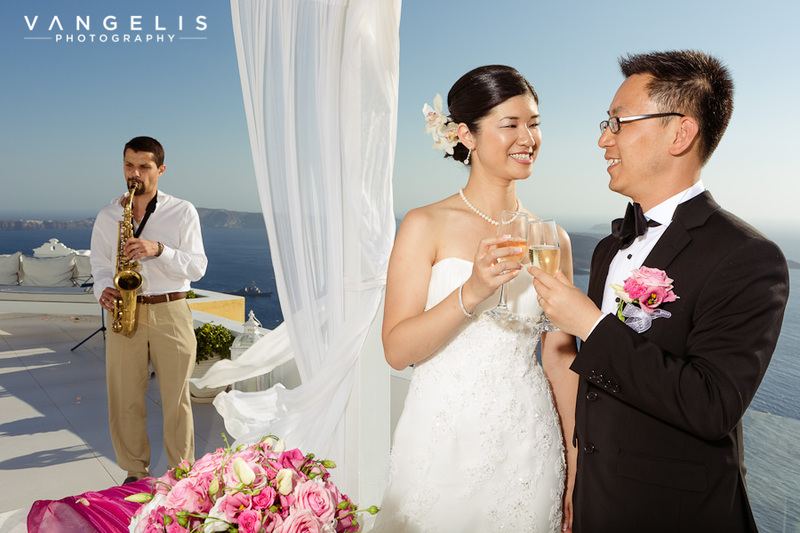 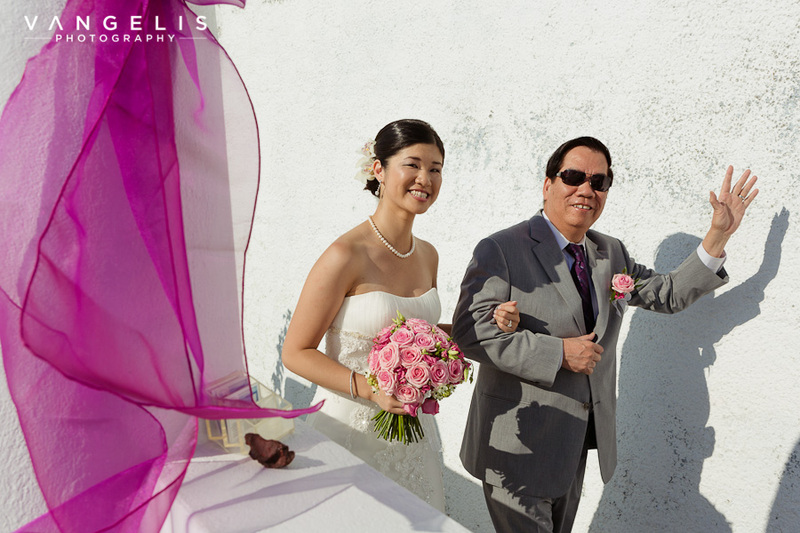 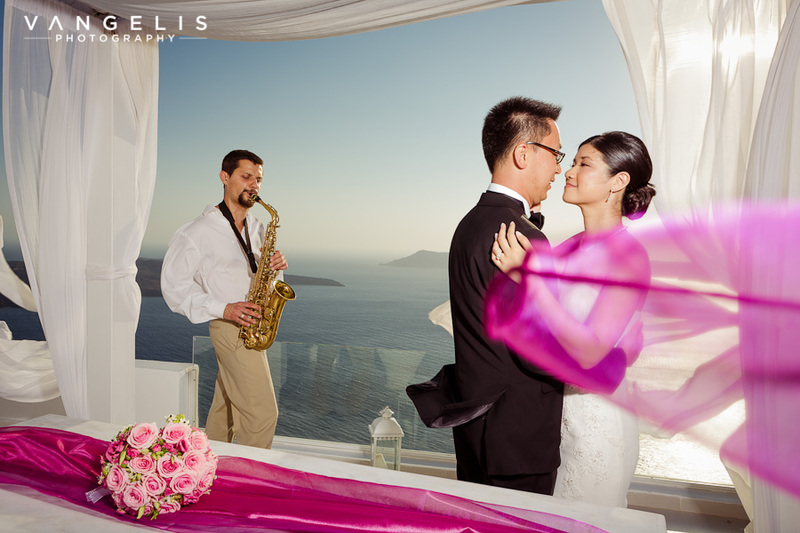 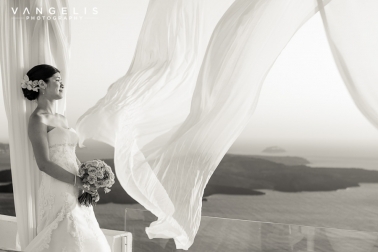 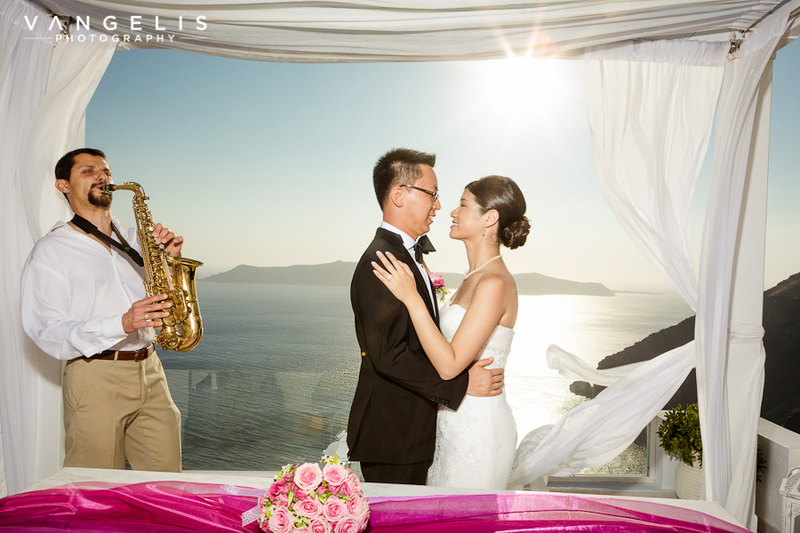 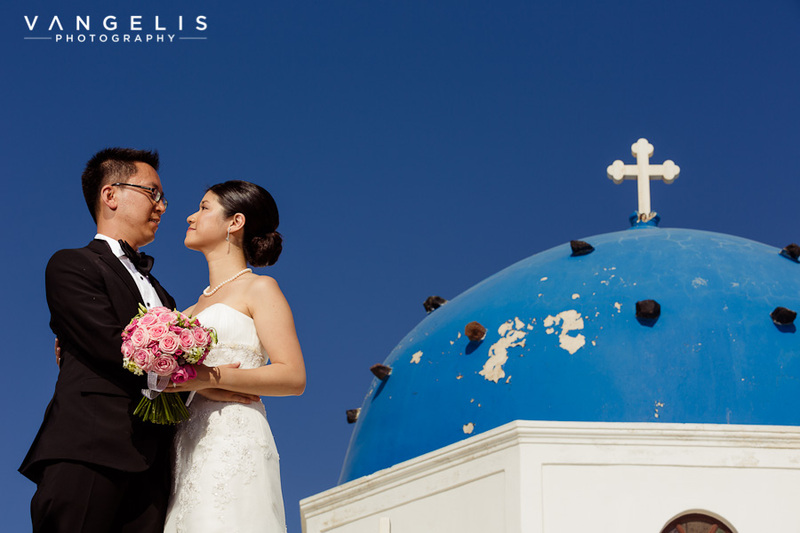 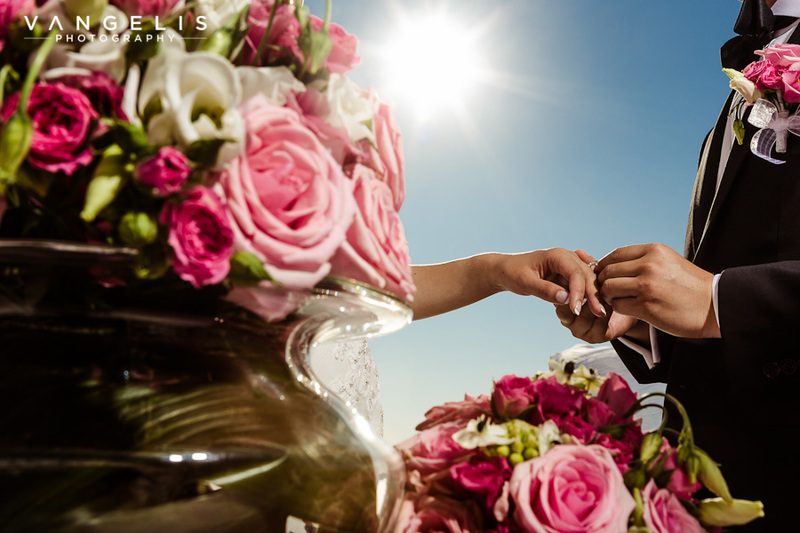 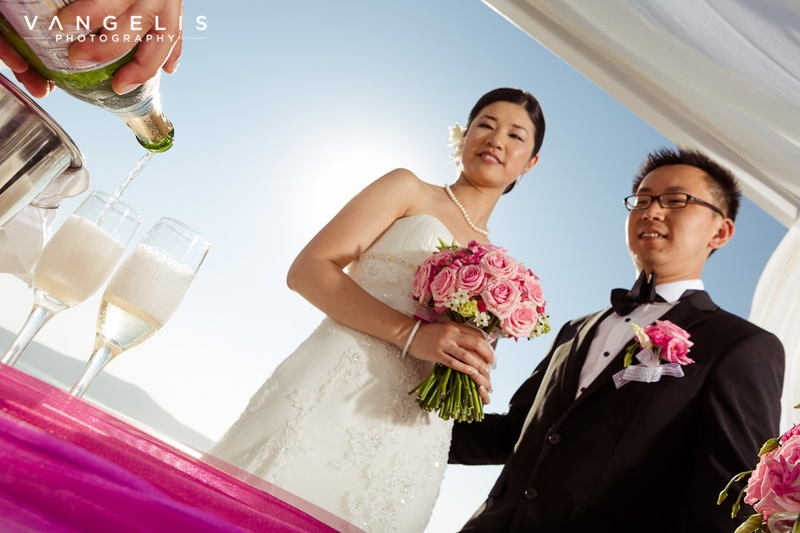 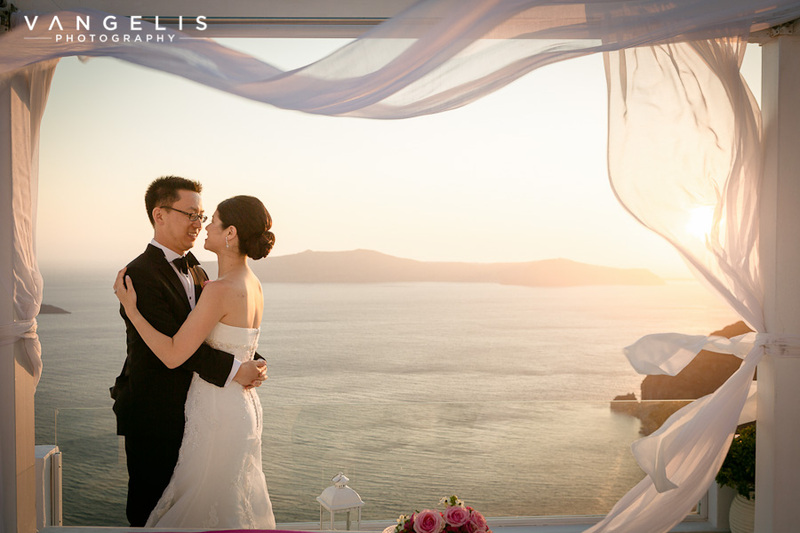 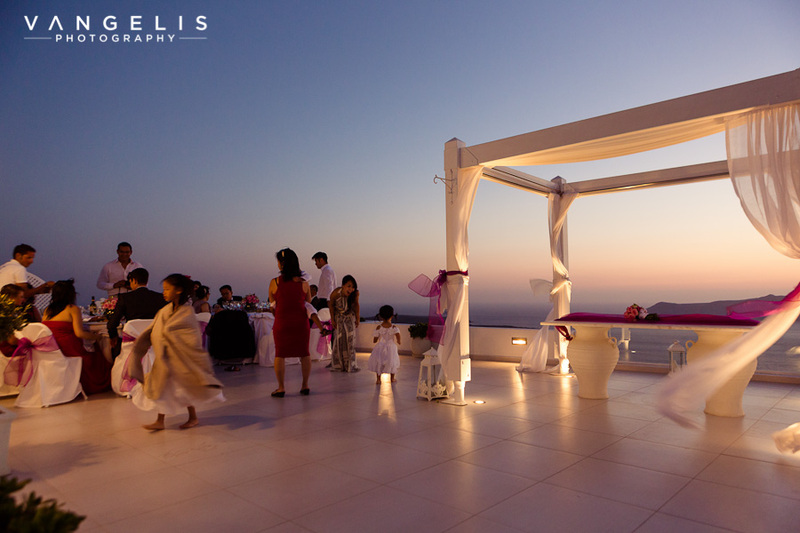 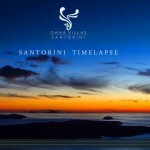 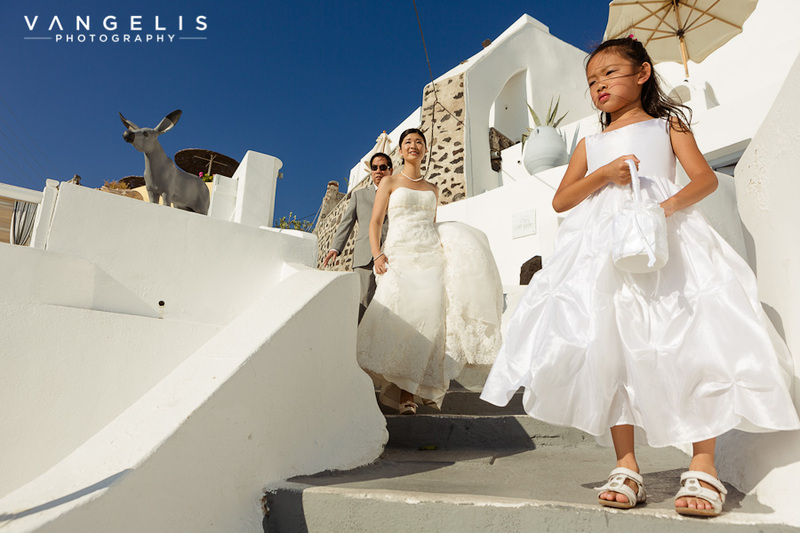 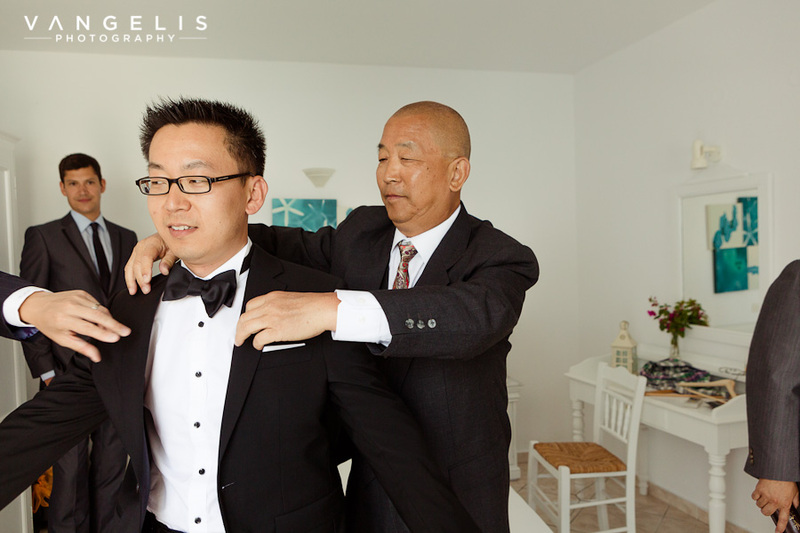 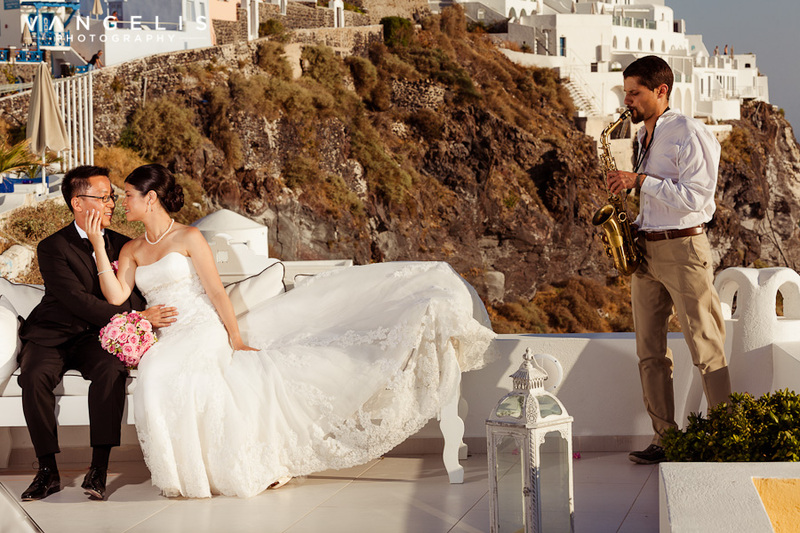 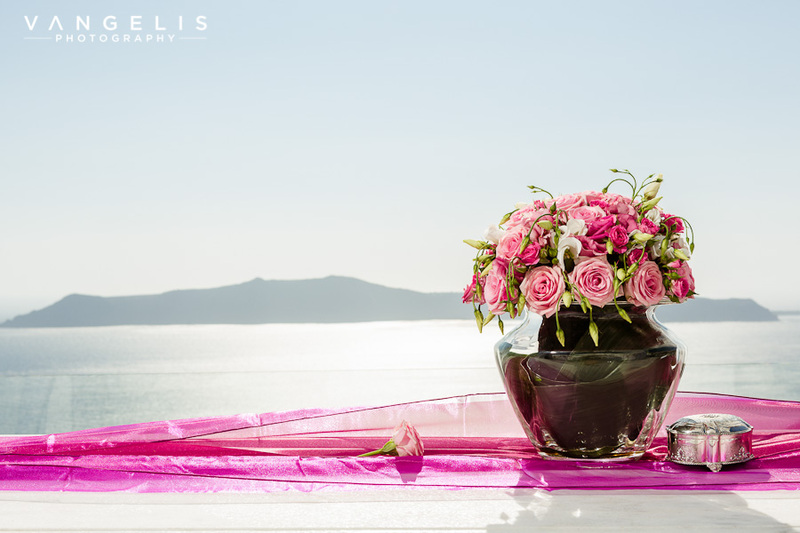 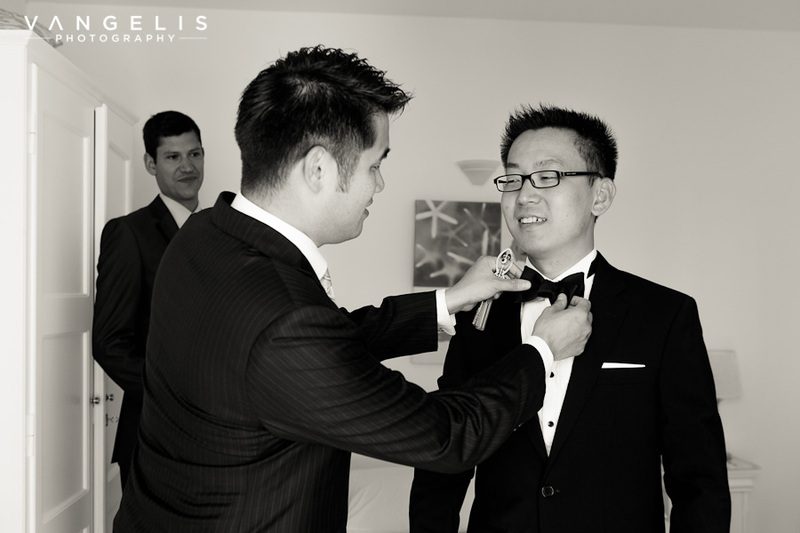 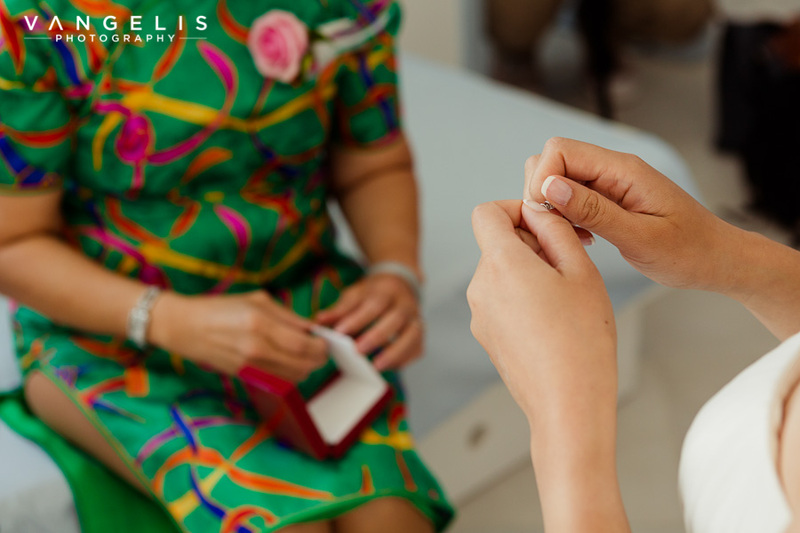 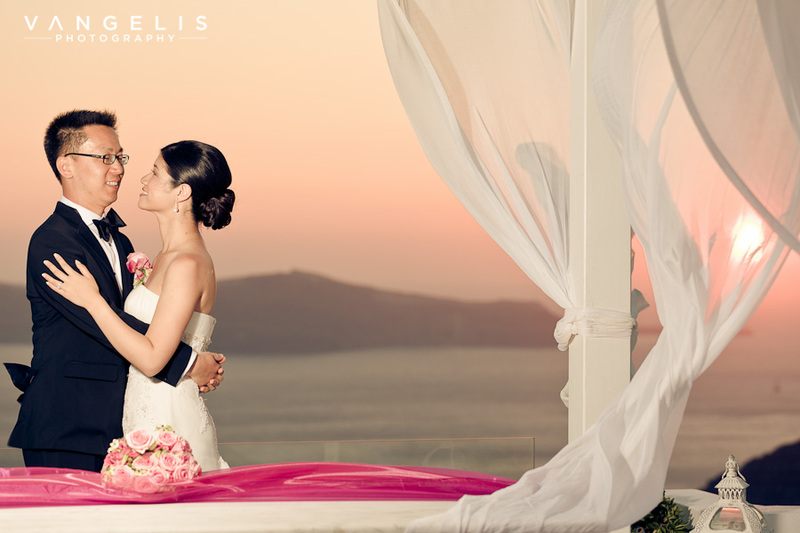 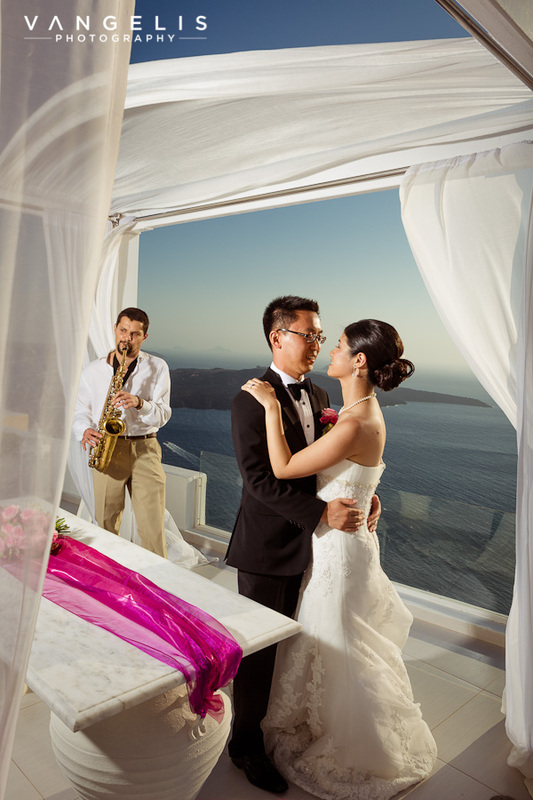 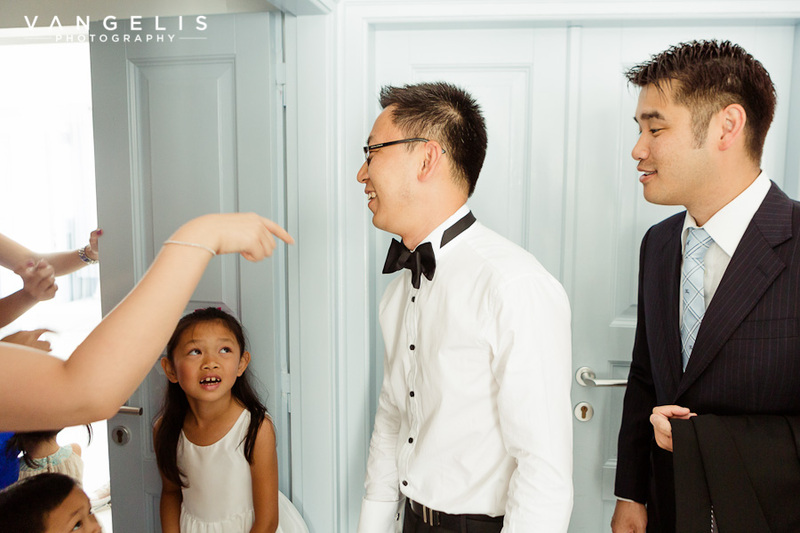 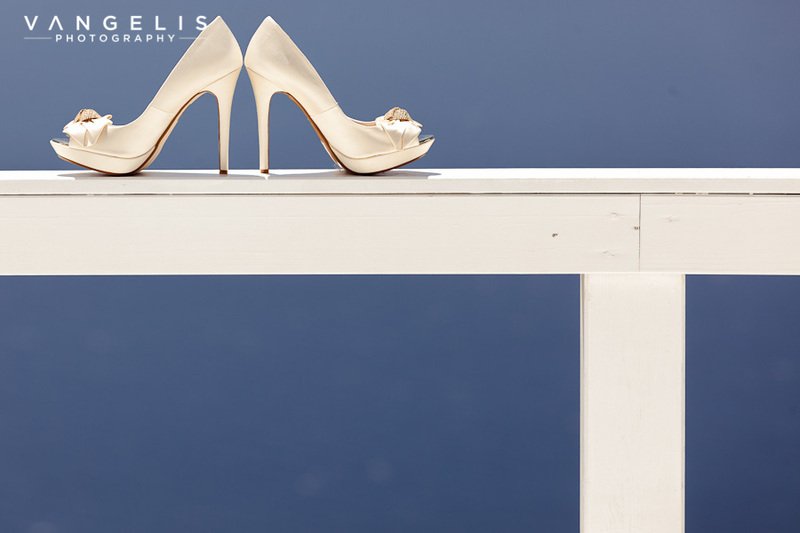 Their chosen photographer was Santorini wedding photographer VangBeltz from Vangelis photography that was with Stephanie and Wallace since earlier that day during their preparations and the fun with their friends and family members. 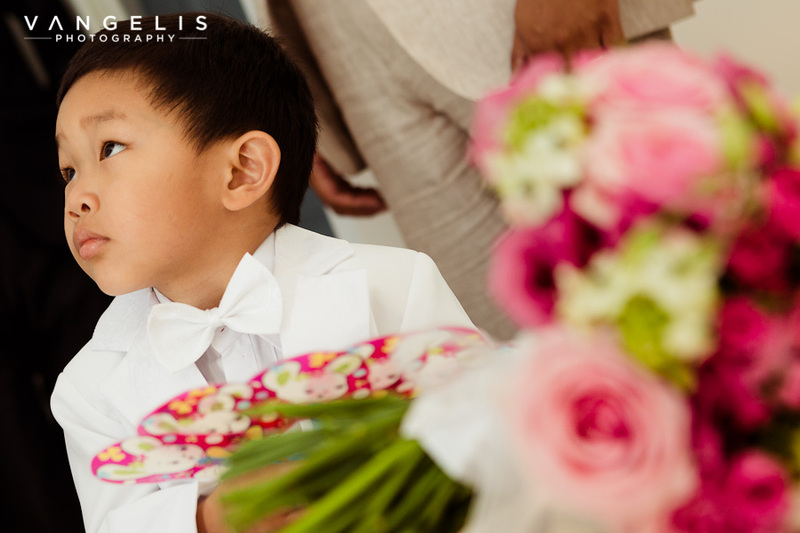 Their day begun with preparations for Stephanie with hair and Make up by professional Makeup Artist Renia Bledaki and Bella Damigou Professional Hairstylists while Wallace prepared with his friends. 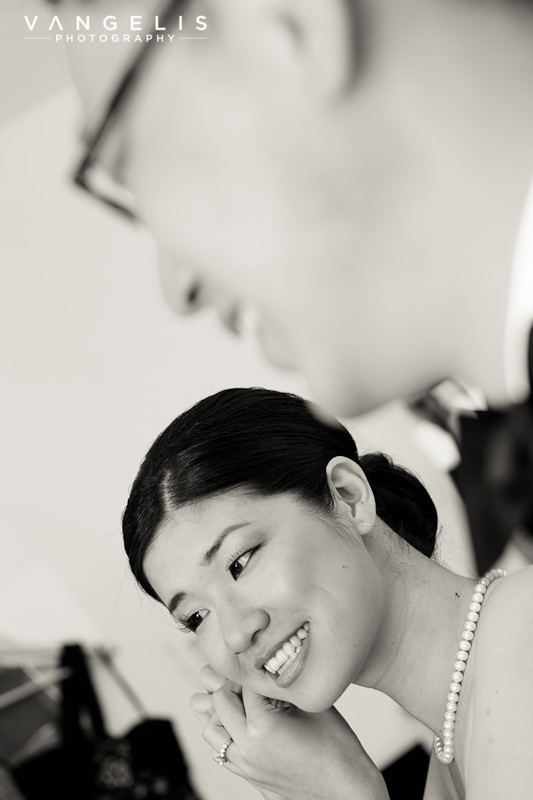 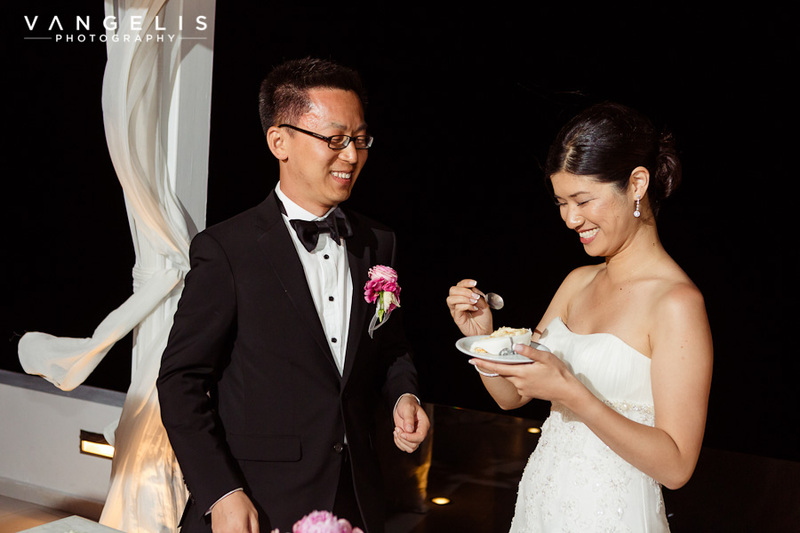 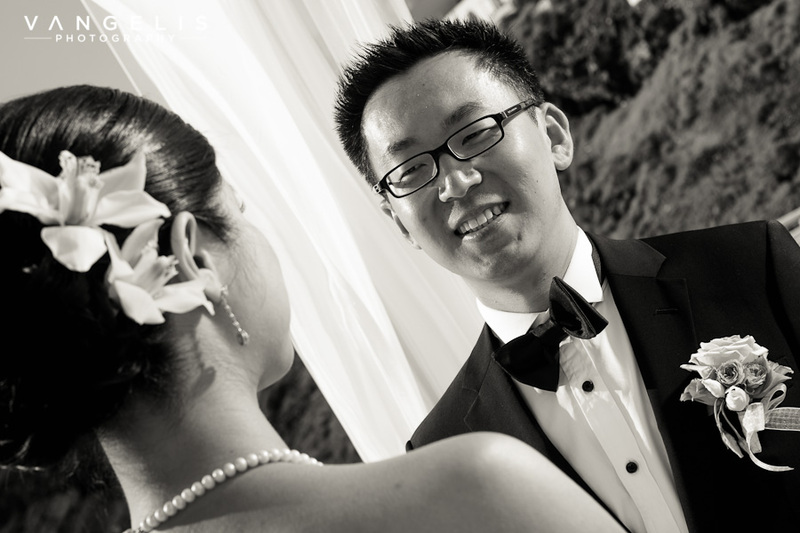 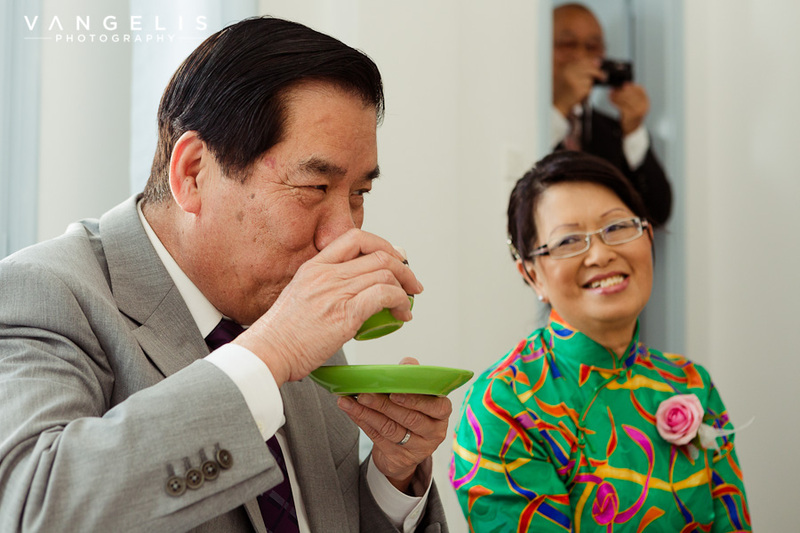 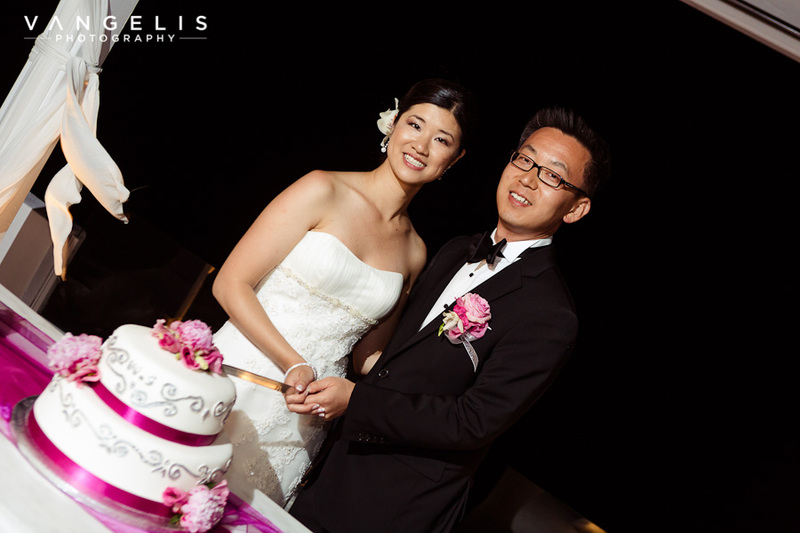 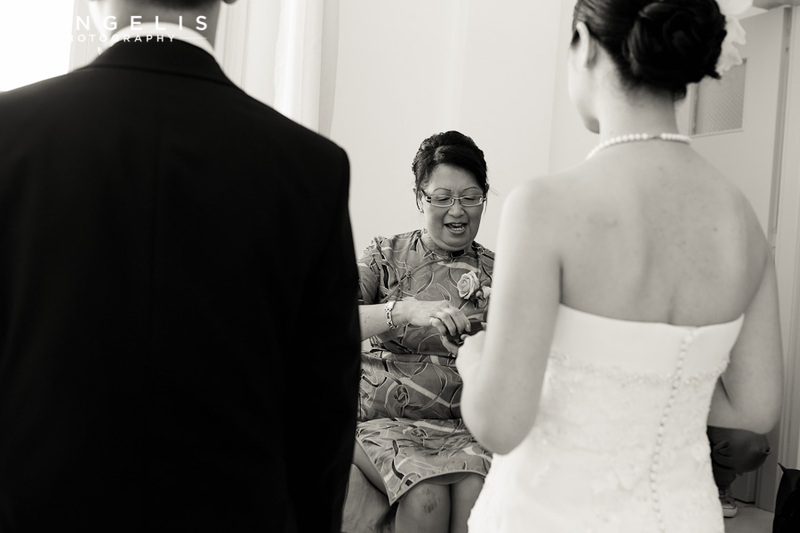 the lovely couple prior to their wedding enjoyed a small traditional Chinese Tea ceremony. 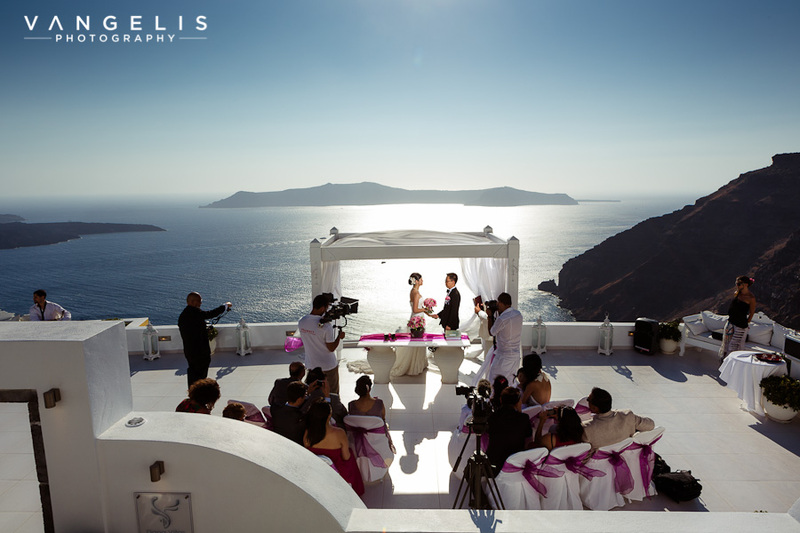 The Professional Cinematographers Miltos Photopoulos & Chris Charitidis from Studio Phosart were present in every special moment of the day from the early morning, through the months of correspondence with the lovely couple the Phosart cinematographers had prepared a detailed plan for the day along with Stephenie and Wallace to assure they would capture everything that they had been planning so many months in advance. 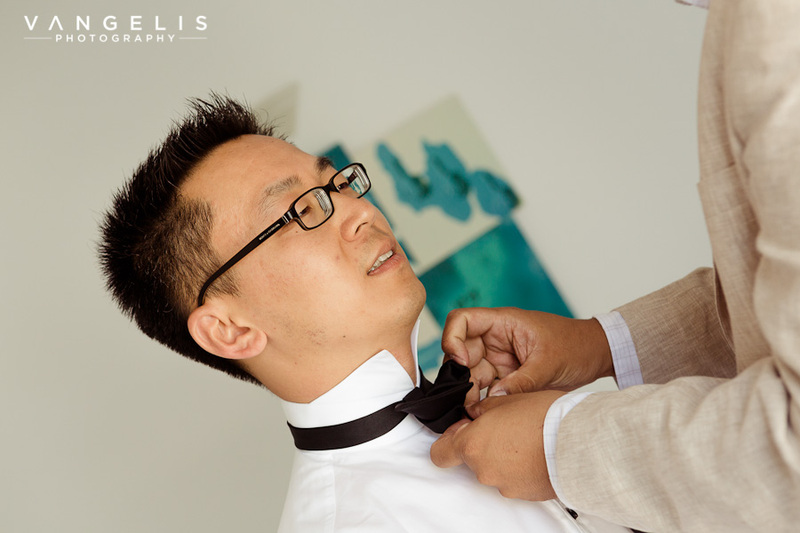 Early that day Miltos and Chris from Phosart where with Wallace and Stephanie in their separate suites for all the preparations and met at the tea party that soon followed. 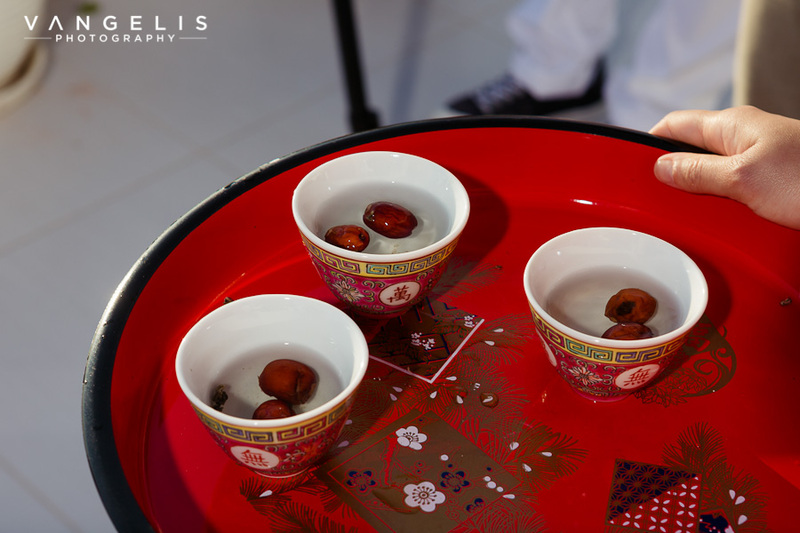 The traditional tea ceremony is an ancient tradition in China where the bride is invited to the groom’s house in order to receive the wedding blessings from the Groom’s relative in order starting from the grandparents and ending with the groom’s family’s youngest members. 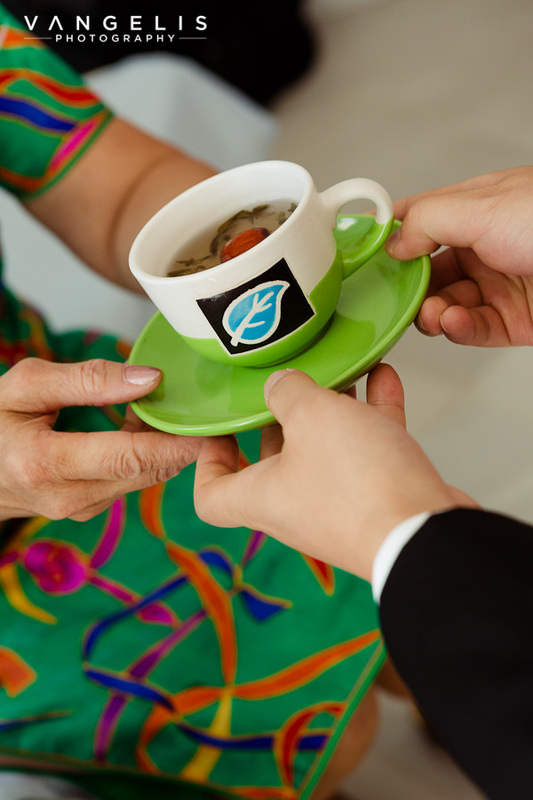 One by one the bride will offer tea to the Groom’s family members and receive their blessings and advices for a happy marriage. 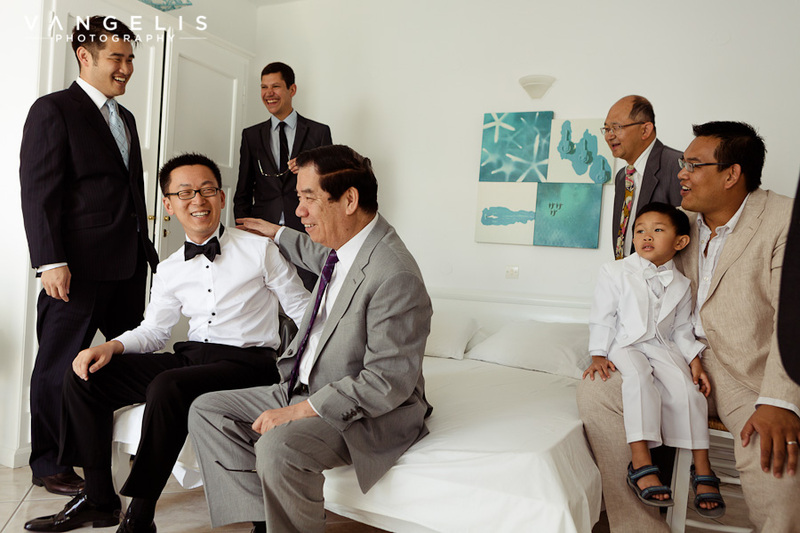 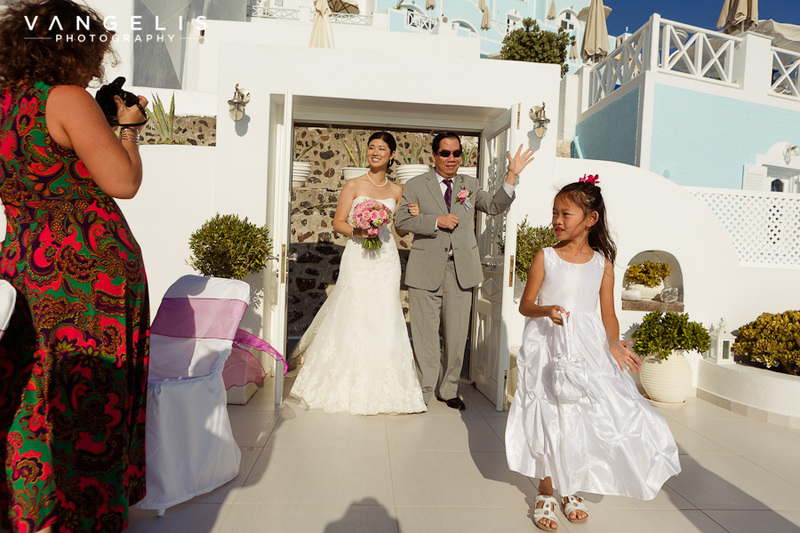 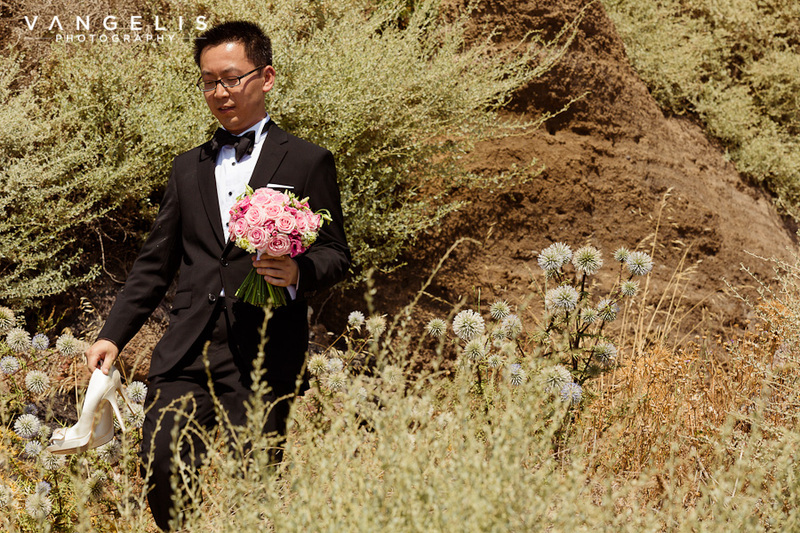 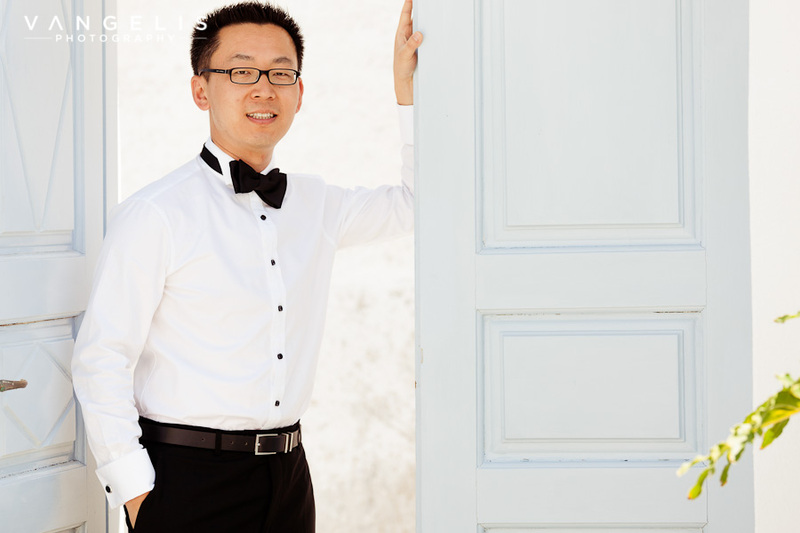 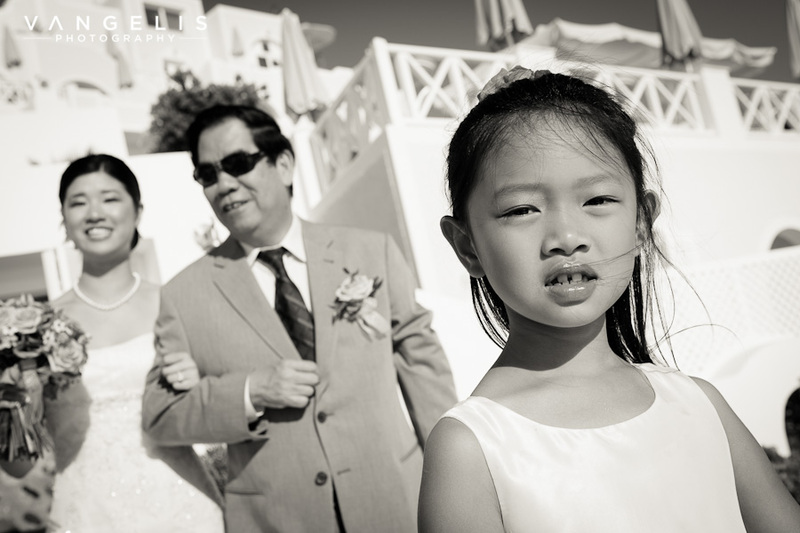 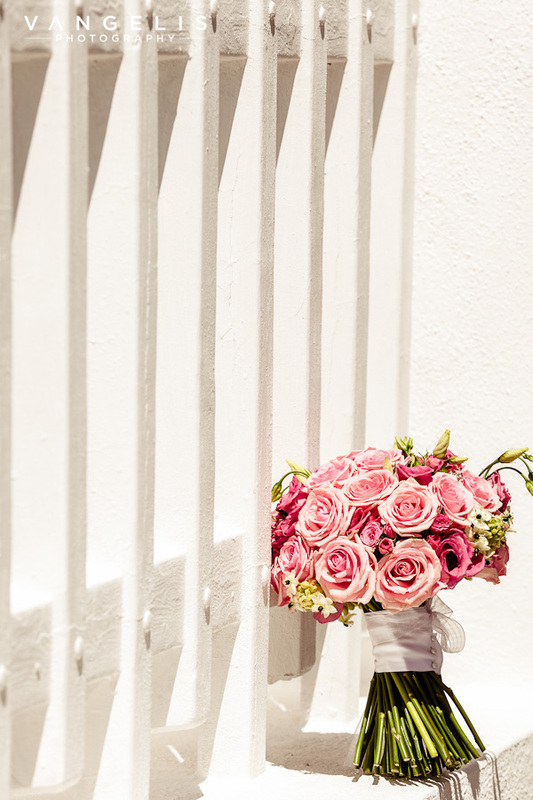 In the early afternoon hours Wallace along with his friends and family arrived at the Dana Villas Santorini wedding venue and enjoyed the romantic music relaxing and awaiting Stephanie’s arrival accompanied by her father and the young bride’s maid. 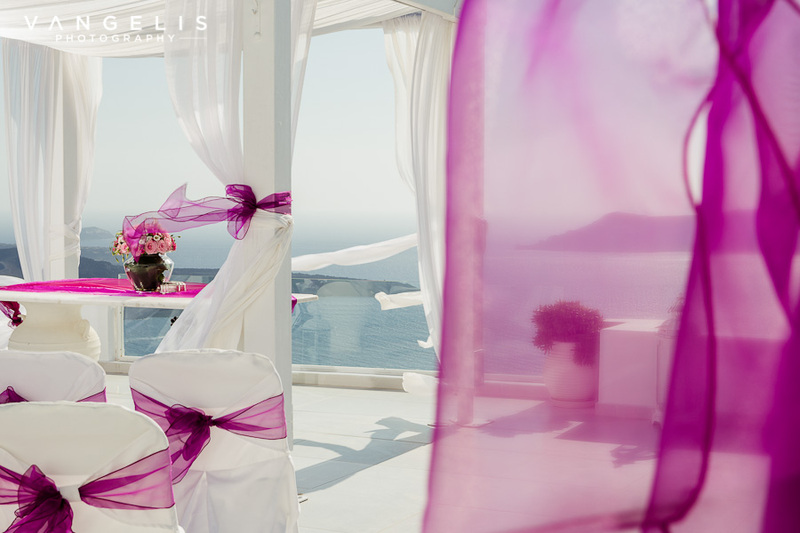 The wedding patio had been created exactly as the couple requested by Poema and Agrokipio and it was a magical sight with bright pink and purple colored fabrics, elegantly decorated roses and bright pink chair sashes along that came even more to life with the bright fabrics moving in the summer breeze that afternoon. 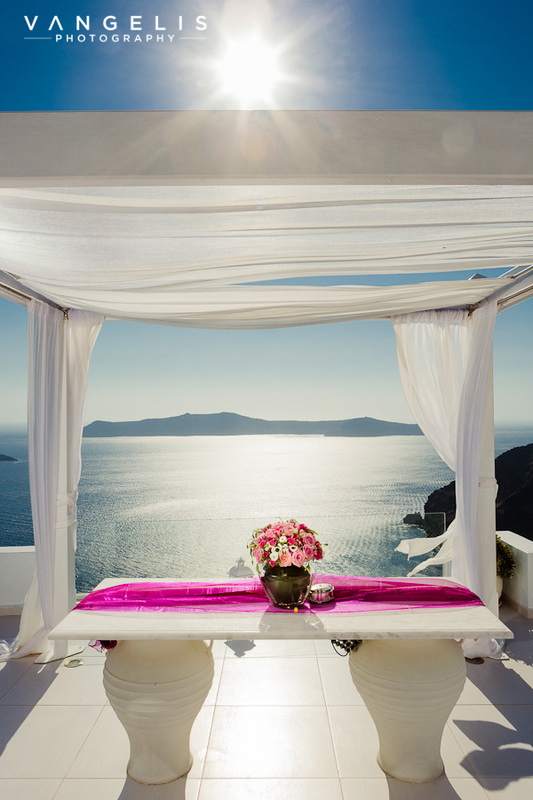 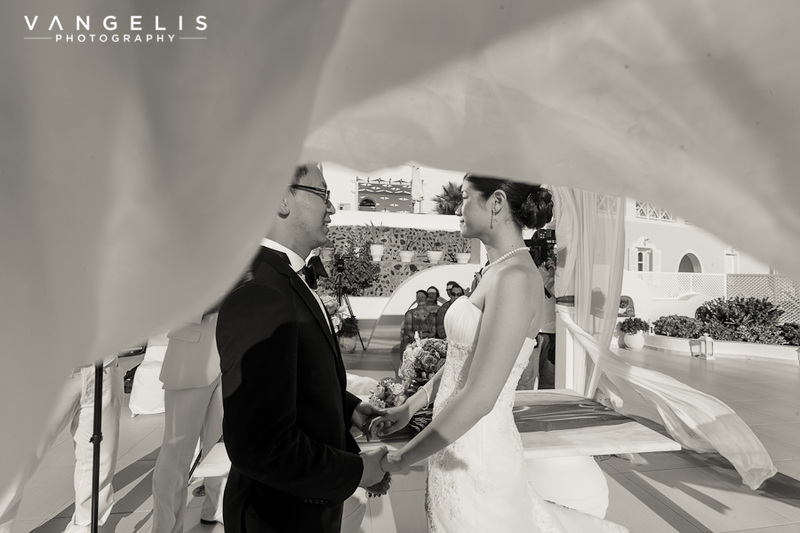 Stephanie approached the wedding terrace with her father and took her place next to Wallace behind the marble table beneath the white curtain central canopy located centrally in the Santorini wedding patio. 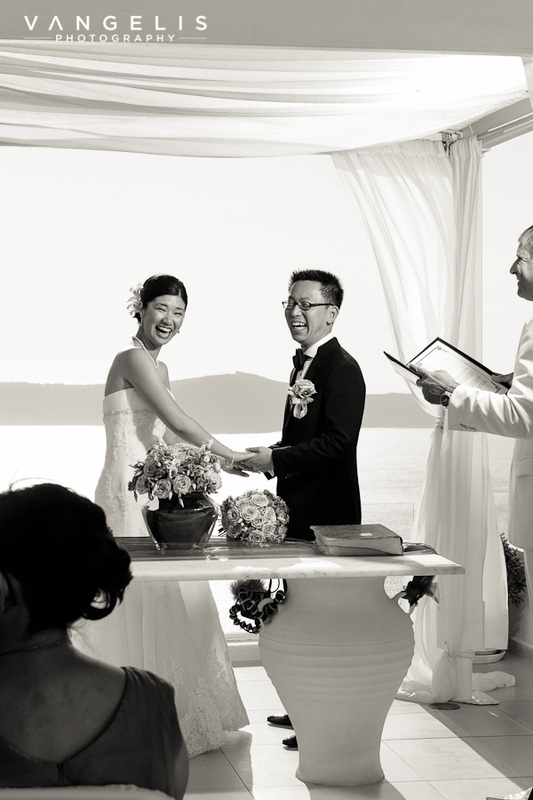 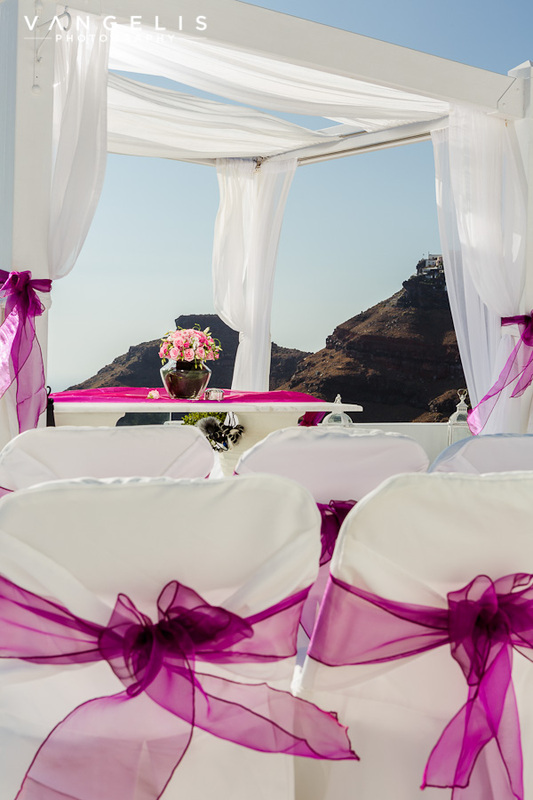 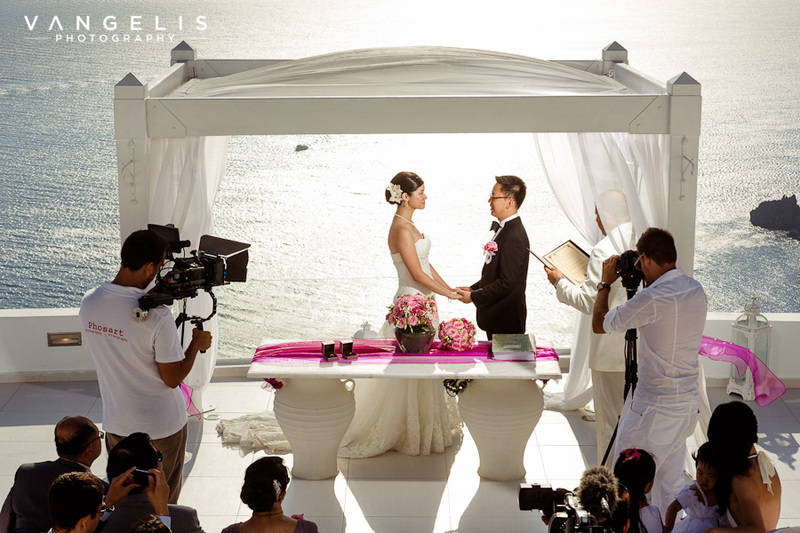 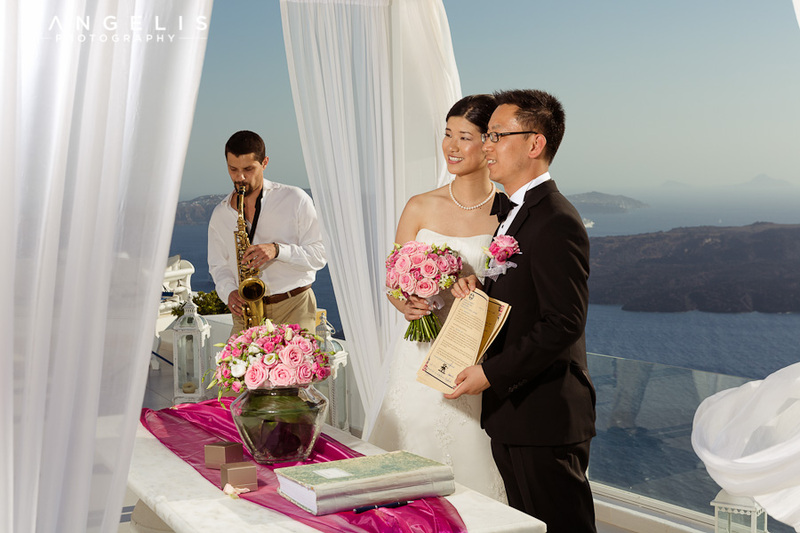 Mr. john Kavalaris, official registrar from the Santorini town hall was guided Stephanie and Wallace through the official vows and soon pronounced them Husband and wife in view of the breathtaking caldera views. 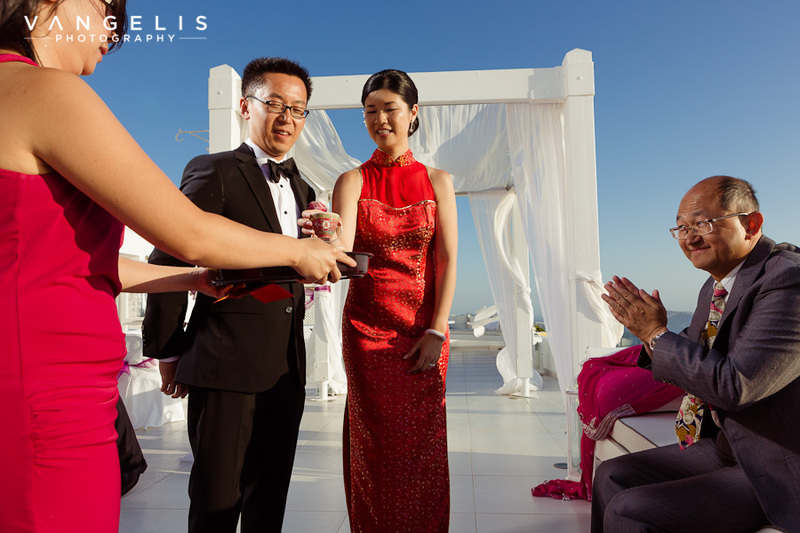 The “Just Married” young couple enjoyed champagne with their guests and received the blessings from everyone present at their wedding. 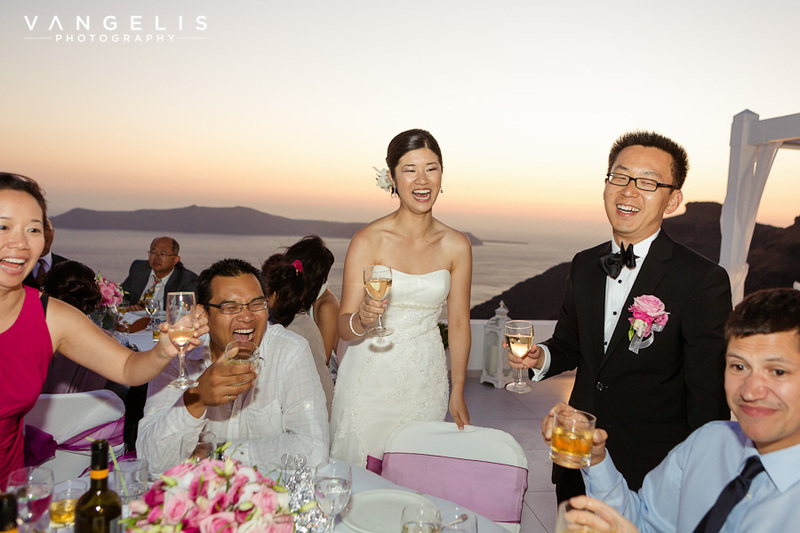 Soon After Vangelis Beltzenitis left the wedding venue with Stephanie and Wallace for a photo session with just the two of them on the Imerovigli caldera just a couple of Minutes from Firostefani where one of the most amazing orthodox chapels is just before the breathtaking Skaros rock Area. 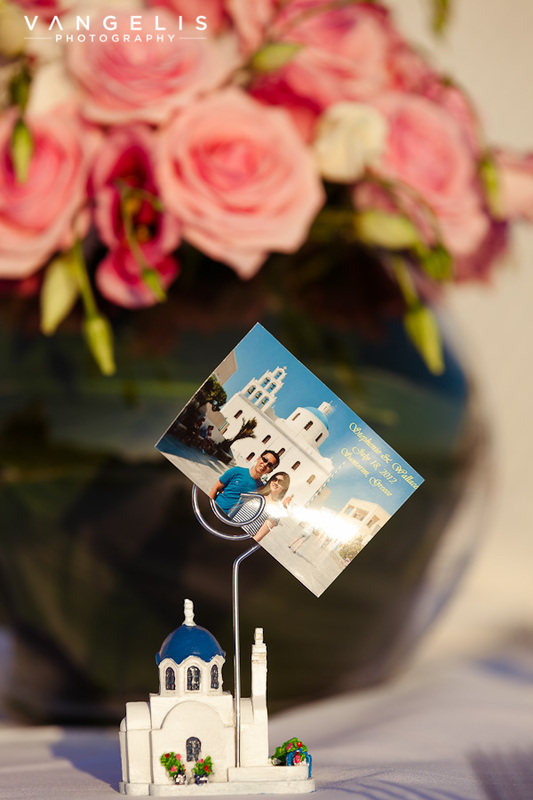 The guests enjoyed drinks canapes and finger foods while Stephanie and Wallace where away and the Dana Villas staff where quick to begin the set up of the dinner reception that was to take place on the wedding venue too so soon the wedding patio was set for dinner and Poema weddings and Agrokipio begun the decorations for the dinner reception transforming the wedding venue into a dinner theme matching the requests of Stephanie and Wallace. 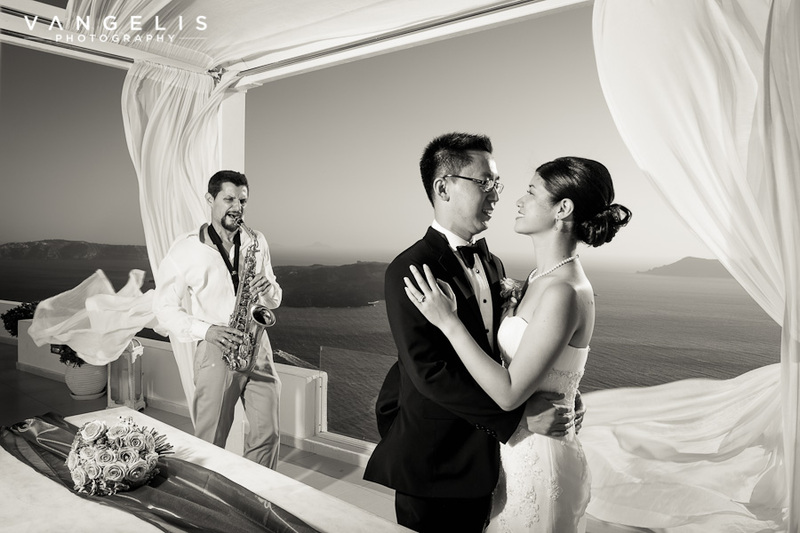 Miltos Photopoulos & Chris Charitidis from Studio Phosart where also close to them during their photo session filming the lovely couple during their walk with Vangelis so the couple would not miss a moment of their day on their video. 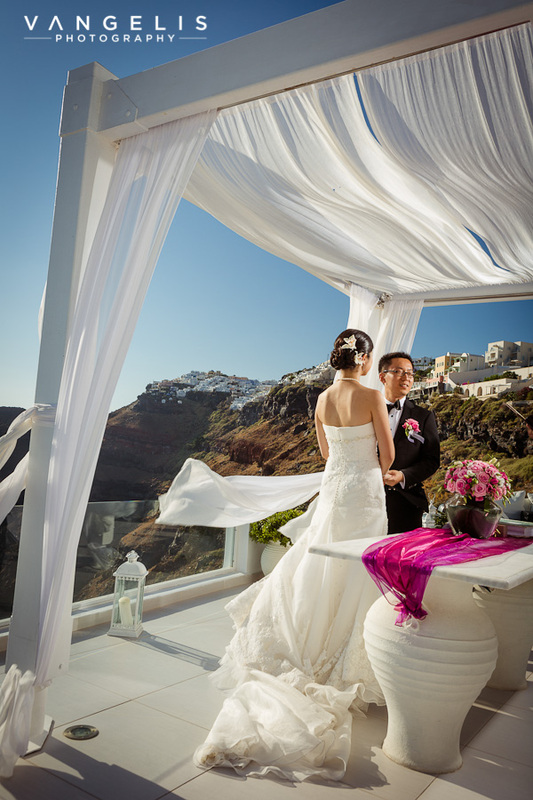 The caldera area and it’s chapels offer amazing video opportunities as each location is unique and Studio Phosart is well experienced with the Santorinian Clifside scenes. 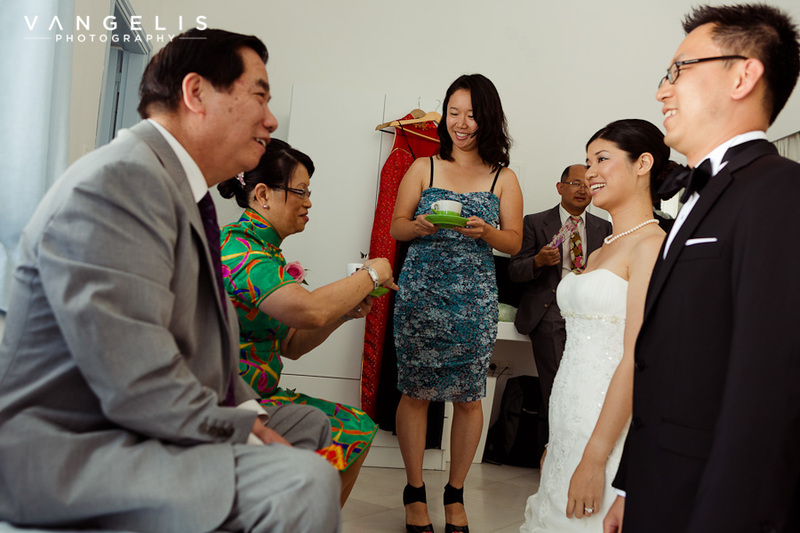 Stephanie and Wallace with Vangelis and Studio Phosart where soon to return from their photo session and Stephanie took a few minutes to change into her bright red traditional Chinese dress in order for the official and second Tea ceremony to take place this time with all the wedding guests attending where they received the wedding blessings frmo all the guests that where there with them and very soon the dinner reception was to begin. 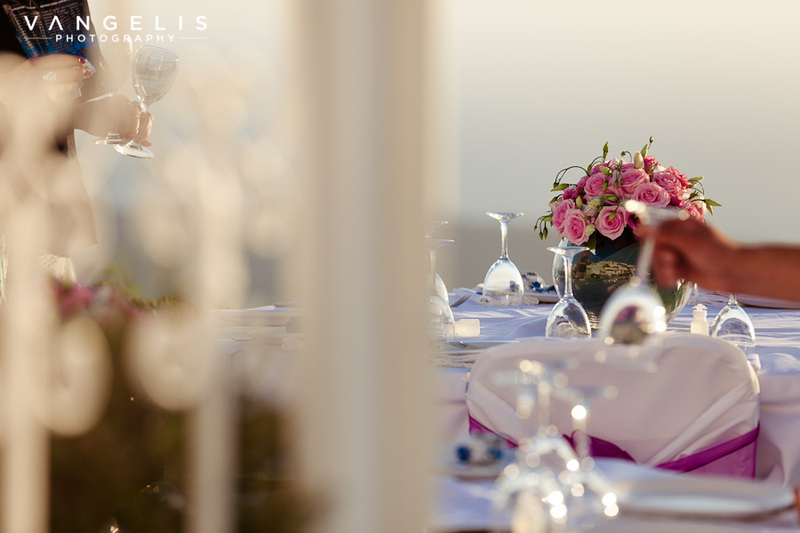 Elegant glass green rose centerpieces where placed on each table and where in perfect combination with the purple sashes taking on a shade of yellow from the sun in the minutes before the spectacular sunset that day. 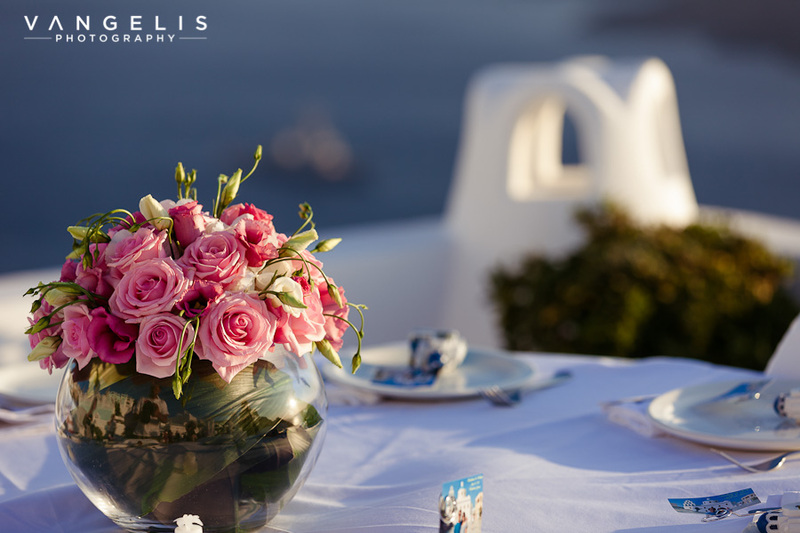 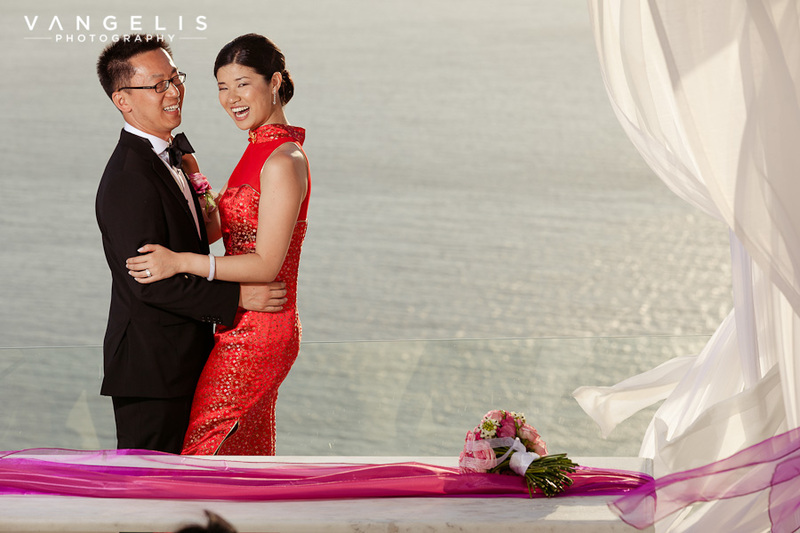 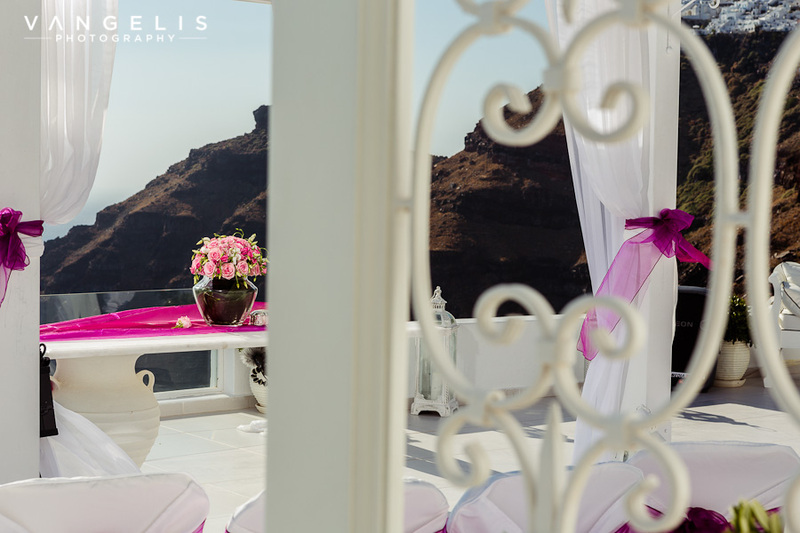 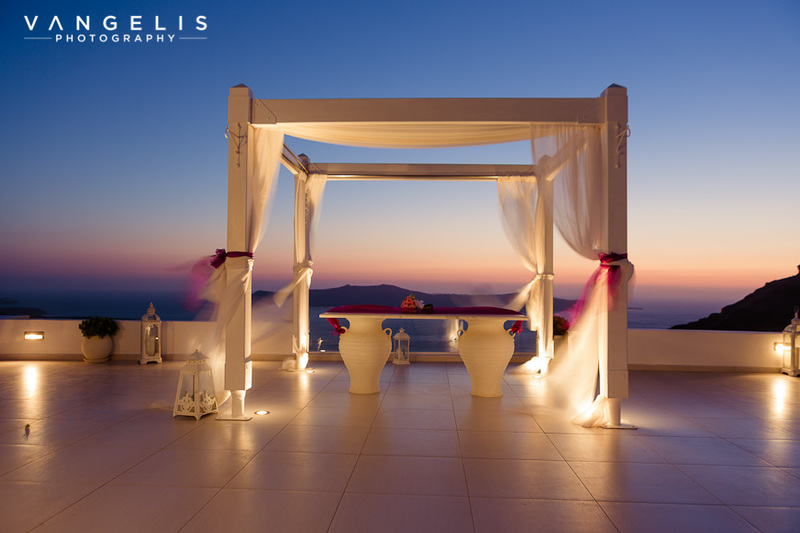 Stephanie and Wallace continued with the photography session with some amazing photos from Vangelis on our wedding venue between the white curtains while Studio Phosart focused on the dinner venue guests and of course the lovely couple in view of the breathtaking sunset. 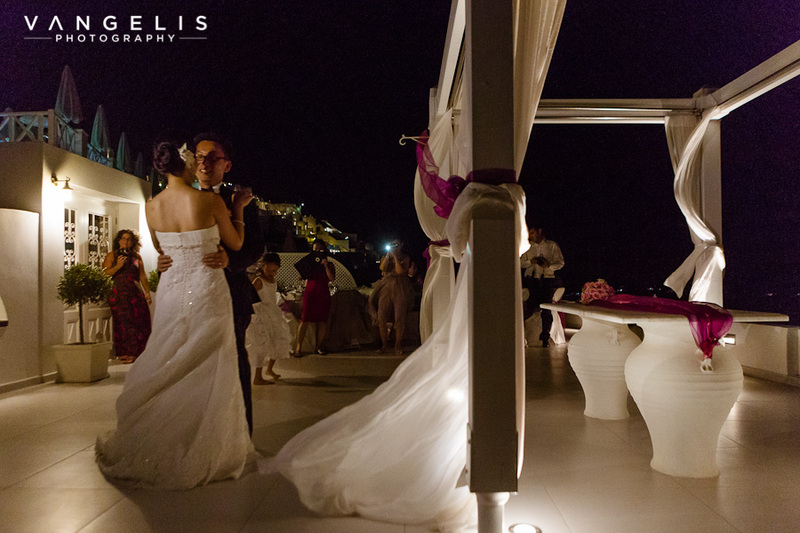 Once the guests where seated the couple passed by each of their tables to thank everyone for being there for them for such a special occasion and the dinner reception began. 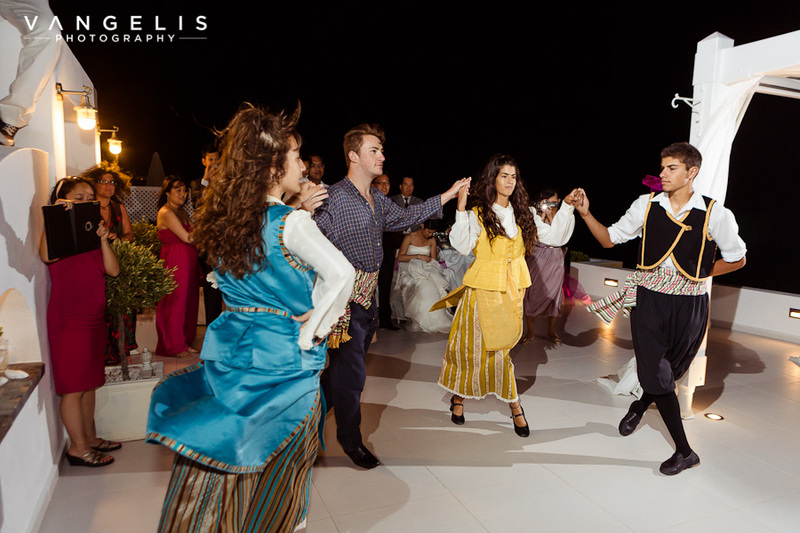 Following that evening the Poema wedding specialists had arranged for some of the Island’s best traditional Greek Dancers to visit the dinner venue and dance in Greek island Style and dance along with the couple and guests. 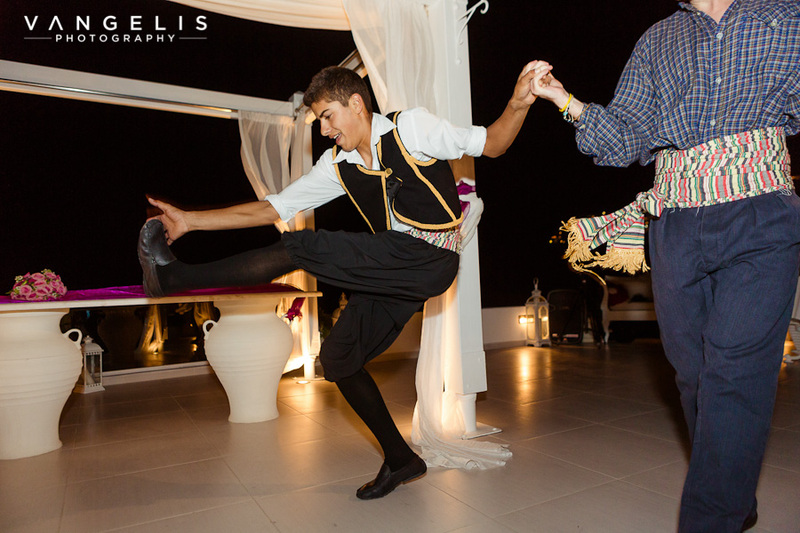 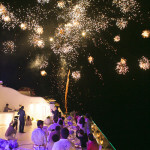 The evening continued with Dancing, fun and an amazing Fireworks display that lit up the Firostefani sky with hundreds of Colors gathering guests from all over the cliff side to come out on their balcony or stop and watch the amazing show.